South Mississauga students are taking the top prize in a national contest, beating out more than 700 submissions with their idea to combat microbead water pollution in the Great Lakes. Samsung Canada is awarding Lakeview’s Gordon Graydon Memorial Secondary School a $50,000 technology grant in the Solve for Tomorrow challenge, focusing on science, technology, engineering and math, or STEM. “The students’ solutions to community issues showcase what is possible when you spark the passion of STEM learning in Canadian classrooms,” said Samsung Canada chief marketing officer Mark Childs. 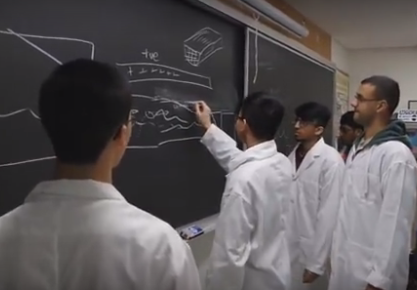 Graydon students came up with a plan to create a sewage half-pipe model which releases microbeads into a collection bin instead of waterways. Public votes were recently tallied to determine the winners. As part of the grand prize, Canadian YouTube stars Mitchell Moffitt and Greg Brown of AsapSCIENCE will be visiting Graydon – and co-winner, South Colchester Academy in Brookfield, Nova Scotia – to film a video. “We can’t wait to meet the rock star students behind these amazing community solutions,” said Brown.